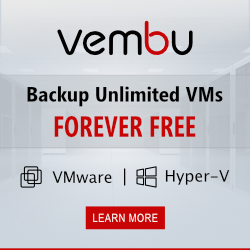 They say you can’t get anything for free but Vembu’s latest offer challenges this assumption. But like in Deal or No Deal you get a choice. You either go for free backup of everything with limited features. 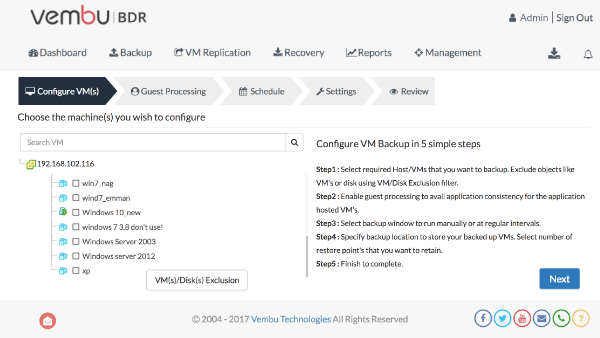 Or you go for backup of a limited number of the virtual machines with all the features enabled. Whichever option you choose, you can benefit from agentless backups, storage pooling, file level recovery and encryption. The features limited to 3 VM’s include low RPO 15 minutes backups, CBT and quick recovery. Choices I hear you say, you can see here the differences between the product versions in this table. Getting hold of it is simple you can download Vembu here. When you first download it you will be on a 30 day trial in which you will get all features for an unlimited number of VM’s. Since the only actual difference between the full and free edition is a licence at the end of the 30 day trial you can choose which way you go, licence to go fully featured or enjoy the free goodness.